Fight Club is brought to us by David Fincher, the director of classics such as Se7en, and Fight Club meets the standards people were setting for it as it is one of the most original films of recent years. It stars Edward Norton as an insomniac who is relieved of his sleepless nights when he attends help groups like alcoholics anonymous. 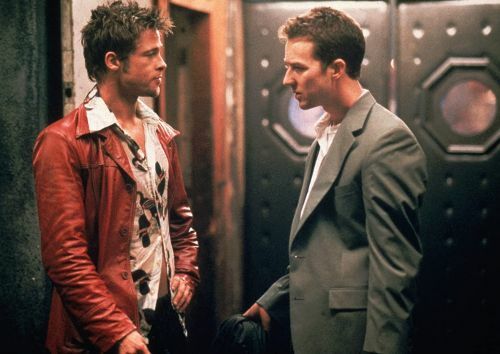 This soon ends when he meets Helena Bonham Carters characters which reminds him that he shouldn’t be there, but it’s when he meets Tyler (Brad Pitt) that the film really starts to get interesting as they form the Fight Club which quickly gets out of hand. Beside from an ingenious plot this film is unforgettable due to the style I’ve never seen before. It gives you an insight into Edward Norton’s head using narration by Norton and a lot of the time narration can be a cheap way to give information to the viewer but in this case is as I said to see in Norton’s head because later on in the film we realise he’s more than an insomniac and to see that develop as were inside his head is almost surreal and absolutely amazing. The film also breaks the fourth wall now and again and thankfully it isn’t too much of a re occurring thing because I feel if it was over used it would’ve gave off the wrong tone that the film was going for. Although the fact that they do only use it on the off chance makes it feel like its Norton talking to himself and at the same time well be getting a little bit off information and all round just adds to the illusion of the loose reality that the film creates. If you’re not a fan of gore however this film may turn you off but whilst the fighting is brutal, realistic and brilliant, the film isn’t really at its core about the fighting and more about the psychological episode in Norton’s life that we get to experience with him. But what stands out in the film is the casting, first of all you have an introverted insomniac that keeps to himself but then he meets Brad Pitt the complete opposite, an over the top maniac who lives in an abandoned house he found and Norton starts to get influenced and slowly becomes more like him, personality clashes are seen everywhere because they are a great means of conflict IF they are believable and for that you’re going to need talented actors and one thing this film has is talented actors. Norton and Pitt give two outstanding performances and when you see the ending you’ll understand why I appreciate them so much however I will not spoil anything. And to quickly add a comment about the cinematography which is diverse and changes up all the time but for good reason, there are some parts of the film where the camera moves slowly and inspects every part of the object of focus and feels almost psychedelic then there are parts giving information and the camera uses fast cuts and these are more specifically used when the fourth wall has been broken and these camera movements are important so you know these wall breaks are sort of bringing you into a different world and that world being inside Norton’s head. And without spoiling anything and if this film hasn’t been spoiled for you then you are privileged because this film has one of the greatest endings to ever be put to film. In conclusion Fight Club is such an original concept, not just for its plot but for everything, even if the name turns you off I recommend you check this out anyway and if your into action films then this is a double bonus for you as it mixes action, drama, good characters and an excellent screenplay which is perfectly brought to life by David Fincher and is one of the most original and captivating films of all time.